Spending some time in preparation for a doctor visit will help you get the most out of it and even save you time in the long run. Here are some tips to help you get the most out of your doctor appointments. Bring paper and pencil to take notes, and don’t be afraid to clarify with your doctor what you think was said. Try to bring along a capable family member or a friend who can serve as a “second set of ears,” and may even be a good note taker for you. Bring any recent blood work, testing, and a list of your current medications to keep the doctor up-to-date. Make sure you include the medication doses and how often you take the medications in a 24-hour time period. If the doctor wants you to have bloodwork done prior to the appointment, make sure that either you or the doctor have the results. Use the patient portal available through the doctor’s office. There you can find all test results, appointment times, and needed follow-up. You can also contact your doctor or provider through the office’s patient portal. Write down every question that pops in your head prior to the appointment. Don’t depend on your memory. Some may be answered during the visit, and some may not. Have your list of questions ready to go, and don’t let the doctor rush you through them. For a first-time visit, be sure to bring a list of all your doctors and therapists and their contact information, your insurance, and photo identification. For repeat visits, let the office know if your insurance has changed since your last visit. If your policy requires referrals, be sure to have them. Doing all of this will help prevent problems with billing and paying unnecessary copays. If you are in need of specialist recommendations (for example, an orthopedic physician, physiatrist, or ophthalmologist) ask the doctor and nurse in the office to see who they recommend. When it comes to getting specialist recommendations, it is best to network with a number of reliable sources, including The Marfan Foundation, prior to choosing the one for you. Check your prescription medications prior to the appointment. Bring a list of those that you will need refills in the near future. It saves time and a possible delay in getting the prescription from the pharmacy. Make sure your doctor’s office knows how you want to be notified of test results. Be sure to clarify it with the physician or nurse prior to leaving the office. Many people prefer to hear directly from the doctor so they can discuss the test results with them. What tips do you have to add to this list? Let us know what recommendations you have based on your own experiences so others in our community can learn from you. 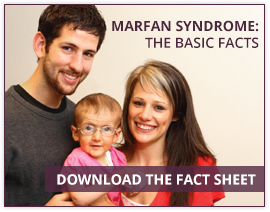 For more information, recommendations and/or support, please contact me at jlynch@marfan.org or 516.883.8712 X126. Jan Lynch, MSN, RN, is the Foundation’s Director of the Help & Resource Center. She can be reached at 516-883-8712, ext. 126, or jlynch@marfan.org.